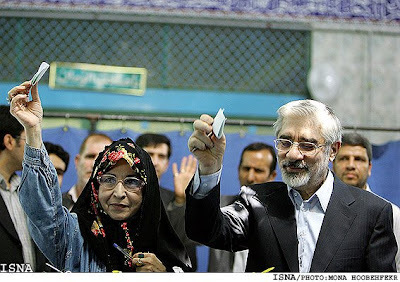 Mahmoud Ahmadinejad claimed victory today in the Iranian presidential election before the polls closed. Polls remained open in Iran tonight, three hours after the end of official voting, with President Ahmadinejad’s representatives declaring victory despite a huge turnout that is expected to favour his rival. Officials estimated that at least 70 per cent of the electorate will have voted, one of the highest turnouts since the Islamic revolution in 1979. Mir Hossein Mousavi, a former prime minister who wants better relations with the West and a more liberal domestic agenda, was predicted to benefit from the overwhelming turnout after an unexpected groundswell of support. Voting was extended until at least 9pm (1630 GMT) because of heavy queues at polling stations, said the Interior Ministry. Back at home, President Obama praised the sham elections. The American president hoped change would come to Iran. U.S President Barack Obama says he sees the possibility of change in Iran, as Iranians take to the polls in a critical presidential race. He said no matter who ends up winning the election, he is hopeful that the fact that there has been that debate will advance the ability of the U.S. to engage Iran in new ways. President Obama has been calling for dialogue with Iran after nearly three decades of severed ties. 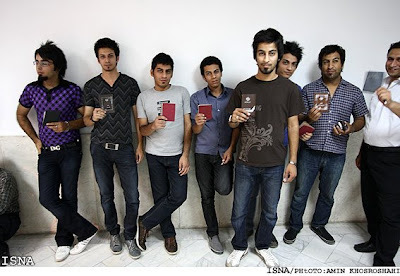 In Iran the mullahs select the presidential candidates. President Obama forgot to mention this. Mousavi started Iran’s nuke program. More… NPR compares Ahmadinejad supporters to Republican Evangelicals. Iran’s interior ministry said President Mahmoud Ahmadinejad took nearly 70 percent of the early votes counted, but his pro-reform rival countered that he was the clear victor and warned of possible fraud in the election. The dispute rose up even before polls closed early Saturday. UPDATE 2: Pajamas TV is following the results.